This is another in our continuing series of blog posts about American-built boats that went sent to foreign countries after World War II. We have looked at vessels built for the Soviets, sent to Germany, and a research vessel sent to South Korea. The United Nations Relief and Rehabilitation Administration (UNRRA) was created to help countries, especially China, to counter hunger problems by developing fisheries.This picture of the F/V Michigan, apparently built in Bellingham, was featured in the May, 1947 issue of the Aberdeen-based The Fisherman’s News. According to various newspaper accounts from 1946-47, the US provided China with at least 72 vessels, as well as sending eleven vessels to Greece and eight to Yugoslavia. The idea was to increase protein production in countries with little food. 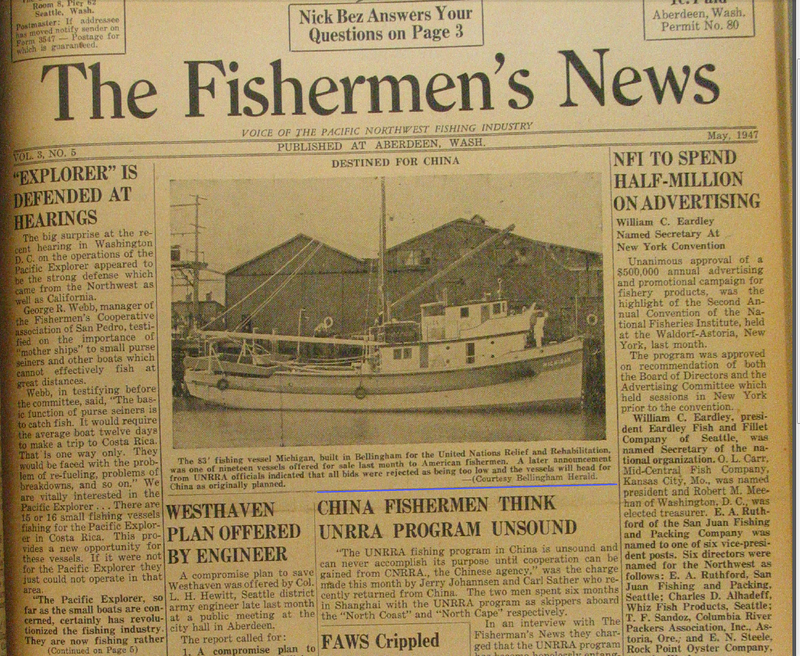 The story quotes two fishermen who had taken boats to China, Jerry Johannesen and Carl Salter, who had taken the North Coast and North Cape to Shanghai as part of the UNRRA program to jump start Chinese fisheries with modern technology. They said the program was hopelessly entangled in “monopolies and rackets.” The UNRRA was calling for 50 skippers to be sent to Shanghai to man the vessels that had already been delivered. 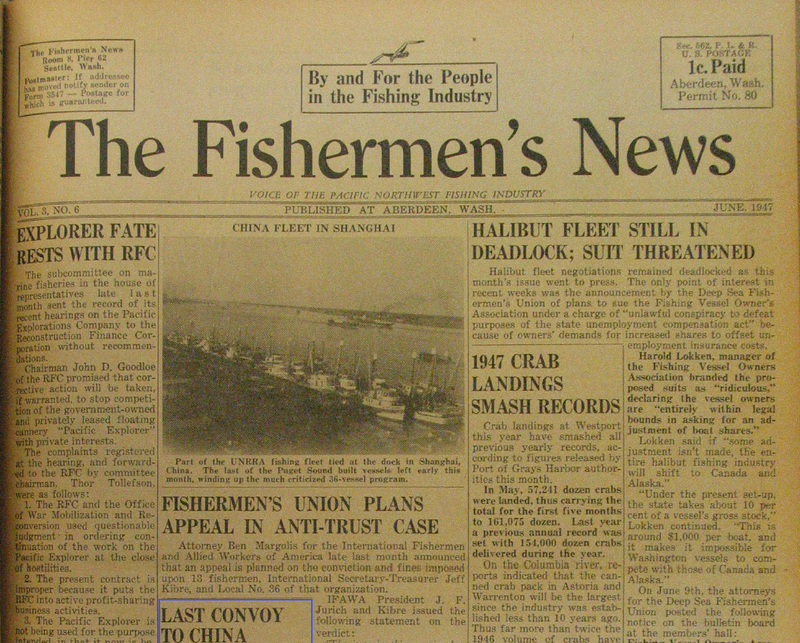 In June of 1947, published this picture of American built-boats in Shanghai, with this article. 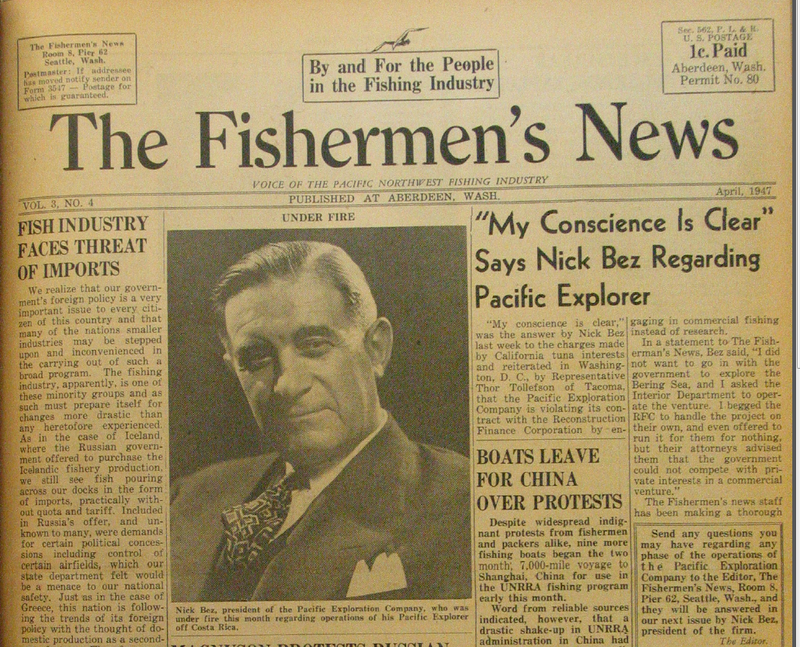 This Aberdeen-based monthly newspaper, started in 1945, eventually moved to Seattle and continue to publish as The Fisherman’s News. This entry was posted in boat building, Chinese fishery development, Cold War, Fisheries policy, fisheries science, Fishing, History of Science, History of Technology, Japanese fishing, Maritime History, Nick Bez, Ocean fishing, Pacific Explorer, Pacific Fishing History Project, Soviet environmental history, Soviet fishing, Soviet history', World History and tagged groundfish, History of Science, Pacific Explorer, Pacific Fishery History Project, trawling. Bookmark the permalink.